Just as Maine lobster has its own special succulent flavor, Maine's locally-grown fruits and vegetables have a taste you can't get anywhere else. If you're eating a fresh catch from the neighborhood day boats, it only makes sense to pair it with equally flavorful, fresh produce. It may not be a match made in heaven, but it's definitely a heavenly match made in the soil and seas of Maine. 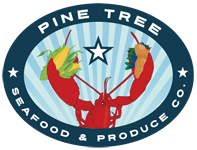 Pine Tree Seafood has partnered with several local farmers who share our dedication to local organic produce, including Pineland Farms, Underwood Farms, Native Maine Produce, PFG, and Pine State Trading Company. Together we are working to offer top quality produce at a fair price. We believe that by working with local farmers we can offer both our business partners and our customers unbeatable rewards, from strengthening the local economy to putting delicious ingredients on their tables. We are proud that our produce looks and tastes different than what you will find in big chain supermarkets. That's because you can't beat the authenticity of real food grown by neighbors who know the land. You'll never have to worry about genetically modified ingredients or foods that lose freshness and flavor on the long journey from the field to your table. When your fruits, vegetables, and other farm-fresh products come from just a few miles away, it's as close to off-the-vine as you can get without grabbing your pitchfork and hat.